Exodus guitarist Gary Holt says he’s ready to write material from Slayer whenever Kerry King wants him to. Holt has been pulling double duties since the late Jeff Hanneman was sidelined by illness in 2011. 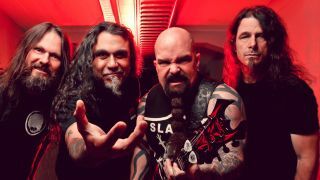 And although he’s recorded some solos for Slayer’s 11th album – out this year – he didn’t contribute any songs. He describes life on the road with Slayer as “easy,” adding: “In Exodus I do most of the heavy lifting. In Slayer, I just show up, have a couple of drinks, play the set then relax. And the only real problem he has is finding the time to play with Slayer, run Exodus and fulfil his family role. “It’s hard,” he admits. “There are times when Exodus has to get someone to fill in for me. I can’t do it 12 months straight. I have a wife and children at home.